Early in “Solo” there is a scene where Han Solo and Chewy must help a band of thieves’ highjack a futuristic train, steel some powerful energy bars, and deliver them to a criminal who has put a price on their heads. In the process of trying to accomplish this space pirates come out of nowhere and attempt to steal the goods right out from under our heroes’ noses. They must do this while the train is moving through snowy mountains and (because it’s futuristic) all on a track that makes the train twist and turn seemingly at random. It is a scene of pure energy, fun, and excitement. It’s the kind of scene that ‘Star Wars’ movies are known for, and if “Star Wars Episode VIII: The Last Jedi” proved to be too thought provoking for the casual fan of the franchise, they will be happy to know that “Solo” is a return to what made the original “Star Wars” a purely joyous discovery. This compliment is more meaningful when you consider the behind-the-scenes turmoil that resulted in the firing of the original directors, whose vision was so chaotic, that Ron Howard was brought in to salvage the project (by reshooting a reported 70% of the film). From watching the finished product, I had no sense that there were any problems during the filming stage. The movie has an arc with a clear beginning, middle, and end. The characters stories all play out in a way that makes sense. Outside of a hiccup involving the lack of a payout from a lost poker game, there doesn’t appear to be any inconsistencies to how the movie flows. For the studios I’m sure this is the best-case scenario they were hoping for, while fans of the franchise will enjoy the fact that this feels more like a classic ‘Star Wars’ film than the previous couple movies did. That doesn’t make “Solo” a great movie by any stretch of the imagination. Truthfully, the movie works mainly because it knows who its audience is and knows how to cater to it. All the actors starring in the movie (and even those behind the cameras) are all clearly enjoying the fact that they are in a ‘Star Wars’ film, having all been kids when the original movie came out so many years ago. For the most part, I would say everyone gets their moment to shine. Much will have to be discussed about Alden Ehreneich as Han Solo himself, as he is replacing the very iconic Harrison Ford in a role that needs to seem new and fresh, but familiar enough that long time fans can comfortably watch the movie without judgment. I feel he does as good a job as anyone could have expected, but for me the stand out performances come from two other actors. The first is from Emilia Clarke as Qi’ra, the love interest of Solo. Her character is wholly original and of her own making, and she plays a good character who may be innocent looking, but, may be able to teach the young Solo a thing or two about playing the field to one’s advantage. Likewise, I feel Donald Glover brings a much more comfortable performance as Lando Calrissian, taking over the role originated by Billy Dee Williams so effortlessly that I doubt too many people will be reminded that the part isn’t being played by the original actor. In my mind, this is Lando, and there’s no debating that. Now then, as for the movie itself I meant what I said when I said it was exactly what ‘Star Wars’ fans wanted: a typical ‘Star Wars’ movie. The big issue with “Solo” is probably that this is pretty much all it is. As divisive as “Star Wars Episode VIII: The Last Jedi” was to the fanbase, it was an actual film that expanded its horizons and brought the franchise into a new era. 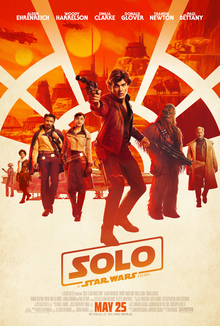 “Solo,” by contrast, does everything that is expected from a movie bearing the iconic title. That it doesn’t do anything else is only going to be a hindrance if you don’t like these types of movies in the first place. Since there’s a lot of people who like ‘Star Wars’ this is unlikely to be a problem. Everything is predicable, fun, and works as it should. For my money I would rather watch ‘The Last Jedi’ again than “Solo,” but as a one and off it’s fine. Truthfully, this may be the perfect compromise for Lucasfilm, who is torn between making great ‘Star Wars’ movies and popular ones. I suspect we will continue to see the main series change and evolve, while side movies like this will be made for those who want throw backs to the “good old days. Parents, I feel the PG-13 rating was a mistake here. While violent, there is no more violence than a typical 'Star Wars' film, deaths aren't very graphic, and there's a bigger sense of fun this time around than there was with 'The Last Jedi.' Recommended for ages 10 and up.